Suitable for vegetarians. Corn & Wheat Soft Tortillas This thin, soft tortilla bread is a staple across Latin America. The most traditional kind are pure corn tortillas and these predate the arrival of Europeans to the Americas. 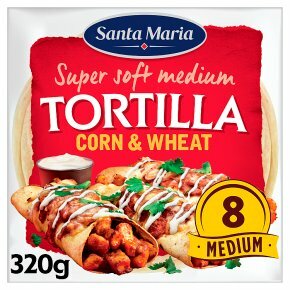 Our version combines corn and wheat to deliver the characteristic corn flavour whilst keeping the flexibility and larger size of the wheat tortillas. If you like to fill your tortillas and bake them in the oven, these will hold their shape better than the slightly softer plain tortillas which only use wheat. To warm - remove from the pack and either: Place on a hot, dry frying pan or under the grill for 6 seconds each side. Or microwave at full power (650W) each tortilla for 8 seconds or all together for 45 seconds. Or wrap the tortillas in foil and place in a preheated oven at 180°C/350°F/Gas Mark 4, for 10 minutes. Tip Hold a single tortilla with a pair of tongs over the gas flame on your hob for a couple of seconds on each side. Warning Use the tongs so you don't burn your fingers! Do not leave the tortilla unattended over a naked flame. Wrap the tortillas in foil and place in a preheated oven at 180°C / 350°F / Gas Mark 4 for 10 minutes.